EarthBound is an incredible game, but it's also become a very expensive one. Use the info on this page to make sure you're not getting ripped off - you can save hundreds of dollars if you know what you're doing! Below are the current average prices for single EarthBound cartridges, complete EarthBound sets, and the EarthBound Player's Guide. I update these by hand monthly by checking all the successful listings on eBay over the past 30 days (in other words, only the copies that actually sold) and then averaging their prices. If you know of any other places, let me know! If you just want to see the guide for reference, the fine folks at Retromags scanned it for preservation purposes a few years ago. Check the scans out here! Nintendo has also put up a digital copy of the guide for free here! 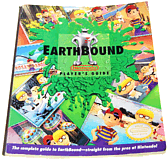 There are a few things you should know when looking for a copy of EarthBound - keep these tips in mind during your search. Note: EarthBound is now officially available on the Wii U and New 3DS Virtual Consoles! (note: EarthBound is not available the standard 3DS Virtual Console, however.) If you're just wanting to play the game but don't necessarily care about owning the original Super NES version, save your money! 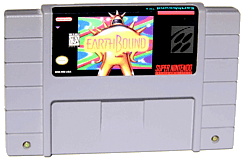 Note 2: EarthBound is now available as part of the Super NES Mini. It offers a much more affordable way to play the game, but watch out for scalpers trying to sell it for hundreds of dollars. Buy-it-now copies of EarthBound on eBay are usually overpriced. If you have the patience, bid on one up for auction. Snipe if you really have to have a copy. If you're lucky, you can get your cart for a lot less this way! EarthBound is not rare. People act like it is (and sellers will even claim so), but EarthBound is not rare at all - at any time throughout the year there's an average of 20 or 30 copies on eBay alone. So don't get caught up in the "rare" hype! EarthBound prices increase dramatically around the holiday season and then drop to their lowest in the middle of the year. This is a regular trend I've noticed over many years of running EarthBound sites. The price never seems to drop back to what it was before the holidays though. Basically, don't buy during the holidays if you want a deal! When buying a complete copy of EarthBound, know that there are different definitions of "complete". Some people define complete as "game, guide, and box" while others consider complete to mean the game, guide, box, and all the extra little unrelated inserts and ads for Nintendo Power. 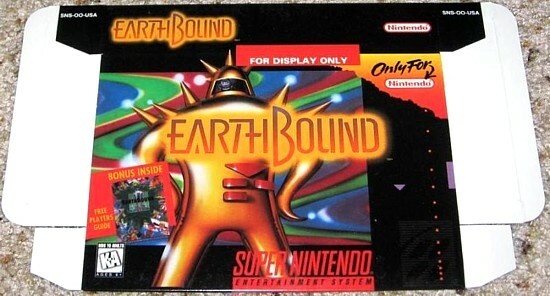 EarthBound boxes were never sealed or shrink-wrapped when the game was released. 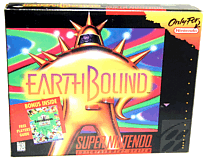 Sellers sometimes shrink wrap EarthBound boxes hoping to trick buyers into paying more, so watch out. Not that that's necessarily a bad thing though - the display boxes are a very nice addition to any collection. Just know that you're not getting a truly complete set. Some fake EarthBound carts have already started showing up, so be sure you're buying from a reputable seller! If you're not careful, you might unknowingly end up buying a copy of the Japanese version, or a bootleg copy that might trigger some of EarthBound's anti-piracy functionality at any random point in the game. Why is EarthBound so Expensive? EarthBound is expensive because it didn't sell well in the 90s but gained an ever-growing cult following years later. Because supply isn't increasing while demand is, the natural result is that the price will continue to rise over time. The fact that Nintendo ignored re-release opportunities (such as the GBA compilation and a Wii Virtual Console release) placed the game on an unusual pedastal for about 15 years. There's now a collision of sorts between three different buying groups: people who want to play EarthBound legitimately, people who collect video games in general, and people who simply want to make money by selling EarthBound for as much as possible to the other two groups. EarthBound prices mostly seem to go up because a seller will see another seller's Buy-it-Now price on eBay, then list their copy of EarthBound for higher. And then other sellers will show up and do the same. Will EarthBound Ever Get Cheaper? Because it sounds like EarthBound was a financial flop for Nintendo, it's possible they manufactured many more copies than they sold. Where are these extra copies now? Are they in a warehouse somewhere? If so, they might help lower the average price if they ever hit the market. If you're looking for a copy of EarthBound, I wish you luck! If you have any questions, feel free to e-mail me at tomato@starmen.net or message me on Twitter at @ClydeMandelin!